Russia's lower house of parliament, the State Duma, passed a bill banning so-called "homosexual propaganda" in an overwhelming 436-0 vote this Tuesday. The new bill outlaws "propaganda of nontraditional sexual relations," which wide-reaching term that refers to any efforts to spread LGBT-related information to Russian minors as well as all gay pride parades or rallies. The law would impose a fine of up to 5,000 rubles (or $156) for any individual who is found guilty of these activities and up to 1 million rubles ($31,000) for media organizations. The bill is expected to get the support it needs from the upper house, as well as President Vladimir Putin, whose Kremlin party is responsible for pushing the proposed law. Russia has long had a tumultuous relationship with its gay community, even after the Stalinist-era law banning homosexuality was overturned in 1993. Anti-gay violence in the country continues to be a serious concern, as evidenced by last month's brutal murder of a gay rights activist and various attacks at gay rights demonstrations this spring. Protesters of Tuesday's bill who had gathered outside the Duma that morning for a "kissing rally" were themselves attacked by anti-gay Orthodox Christian activists and pro-Kremlin youth group members. 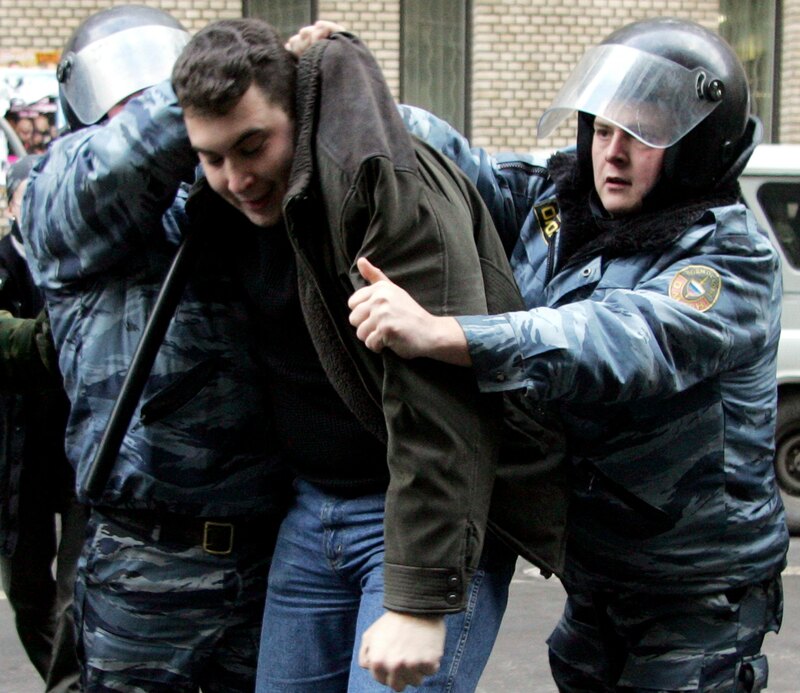 The riot police who intervened in the scene almost exclusively detained the gay rights protesters, and many of those who were not detained were reportedly met with even more brutal violence from masked men down the street.